I think most of us want to feel that we’re spending our time wisely, that we’re productive, contribute our fair share and get the job done efficiently. I felt like that when I worked for a living; I feel the same now working at home. There is no doubt that if you work as a doctor, nurse, teacher, fire fighter, police officer, retail assistant, factory worker, lawyer, scientist or truck driver, you’ll be part of the national work force and be rightly proud of the part you play in the nation’s progress and success. You'll be respected for the role you play in your community and as a bread winner for your family. Homemakers care for children, manage the household budget, have control of the family’s spending, balance budgets, clean, cook and bake for their families, drive children to school and after school activities. They stay up at night with sick children and partners, shop for healthy food while spending the least amount of money, mend, recycle, sew, and they often make many of the cleansers they use. Homemakers send students and workers off every day well fed, clean and ready to work after a sound night’s sleep. Homemakers play a large part in the nation’s progress and success too, but they are rarely acknowledged, let alone respected for it. Homemaking has been looked down upon for decades. That is not going to change overnight. 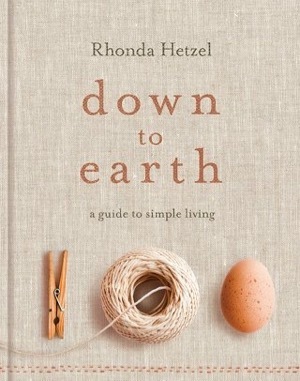 But I think that homemaking has undergone a radial change and not many people know it. Homemaking now has more in common with the 1900 - 1950s style of homemaking, instead of the 1960 - 1990s style. 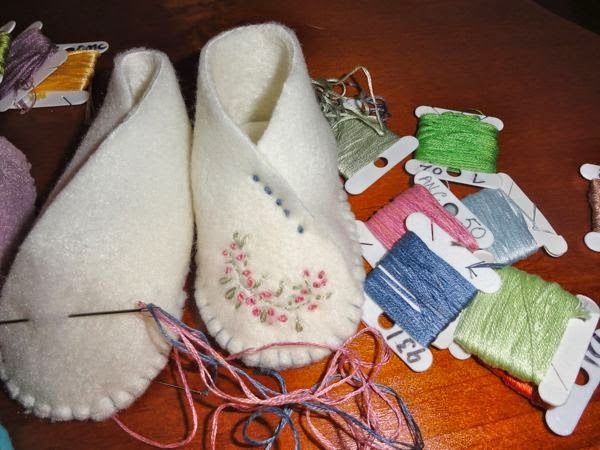 Many of us are now actively engaged in traditional crafts and activities while using using modern technology and appliances in this radical and proactive enterprise. There is a huge group of homemakers who work in the commercial world in addition to their work at home, there are many homemakers who work at home, earning extra money to boost family finances, there are the homeschooling homemakers and homemakers who volunteer in their communities. It's changing. 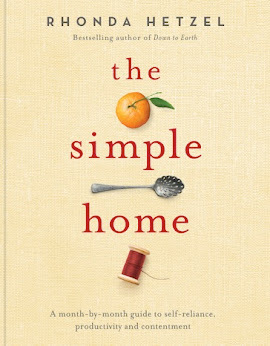 We need to work together to help change outdated attitudes about homemaking, so that not only do we continue our work at home with the support of family and friends, but we also open up the option of a homemaking career for younger people, both women and men, who, right now, might not even know it's an intelligent and important option. You can help spread the word by telling your friends and neighbours about your favourite activities, maybe bread and soap making. Show them your knitting and sewing. Demonstrate your life in gentle ways. Be your own best advertisement. If we can develop our own strategy to talk about our work in a way that highlights the significance of it, if we show, by example, that homemaking makes us content, if we reskill ourselves for a productive future, if we guide our families with grace and confidence and if we share our experiences in a thoughtful way then we'll gain some of the support we all hope for and validate our choice to be what we are. I know that my life is better now that I take care of my home and family as my main concern. It wasn't always the case. I never really knew the significance of caring for a home until I gave up work and came home. 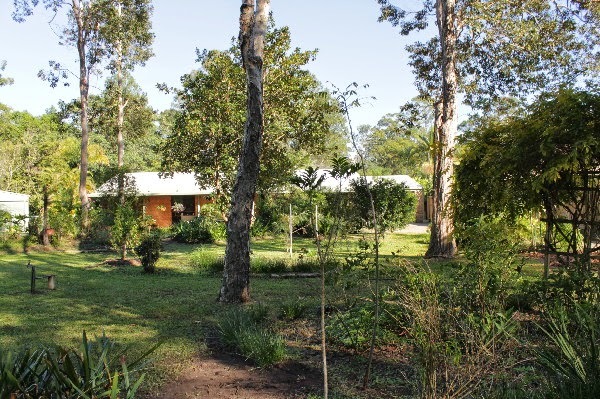 I realise now that the day-to-day tasks of homemaking - the bed making, sweeping, cleaning, laundry, cooking and the physical work of a home, as well as all the sitting on the front verandah relaxing and thinking, created the person I have become. 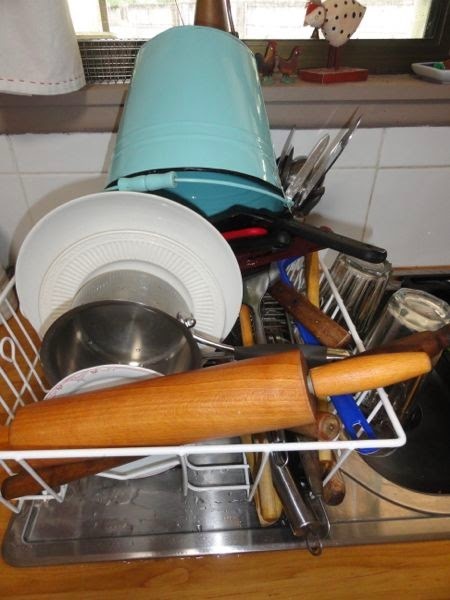 But there are many women who balance work, volunteering, home businesses, homeschooling and homemaking. We all work in different ways but we are doing the same work, we're caring for family and home - our nations' true assets. Homemakers make most of the buying decisions in the home and that gives you and me the power of the dollar/pound. Use it. If you don't like the service you receive, if the goods you buy are faulty or inferior, complain. When we're assertive, shopkeepers listen. They're not stocking an ingredient you need? Ask for it. Shopping is best done with a happy mindset, it's not an exercise of walking behind a trolley picking up products and dropping them in. It's much more involved and active than that. Read labels, know what you're buying, ask, know your products and where to get the best deals. We want good quality and the best value for our money, the shopkeepers want you to take what is in the shop at the advertised price. Shopping is our battlefield. Doing it well gives you the power of the money you spend. We all have to take advantage of that. Modern homemaking is an independent creative activity, it can be whatever you want it to be and it will give you many wonderful reasons to get up every morning. If you really do become what you do, then I have become a modern homemaker who wants to show women and men a way of life that will slow them down and bring enrichment and meaning into their lives. My home has become a centre point for me, where I am made content and self-reliant by the work I do. Right here is where I find a steadfast inspiration every day to carry on. I didn’t know a life lived like this was possible until I stumbled into it. My home is where I reclaimed my independence and discovered how to live well and to my true potential. It may not be everyone's choice to work at home doing household chores but I have been enriched by it and I doubt I would be as happy as I am without meaningful work to do every day. I don't want to live a life where I don't have to do any work, and I don't want to be dragged down by it either. I have found a good balance that requires of me that I plan, work and put in the time and in return I get this feeling of sublime contentment. And I am thankful that homemaking slowed me down enough to discover that, to enjoy the natural world surrounding me and to enrich my spirit. The forecast is for a cold weekend, the bright glare of sunlight has evaporated, leaves are turning yellow and soon the wisteria vine will be bare. The months from now till October are my favourites. 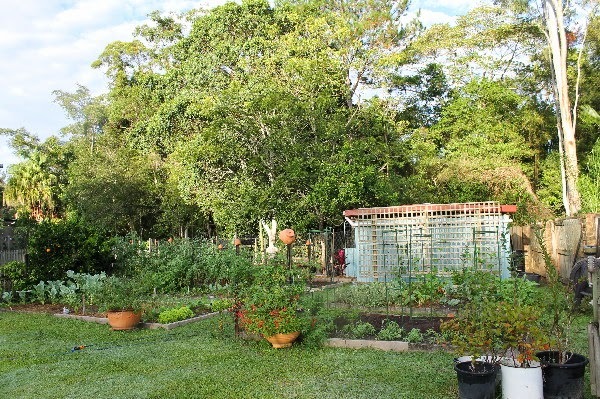 I feel more energised, a fertile garden out the back is primed to produce abundant crops of fresh organic fruit and vegetables. 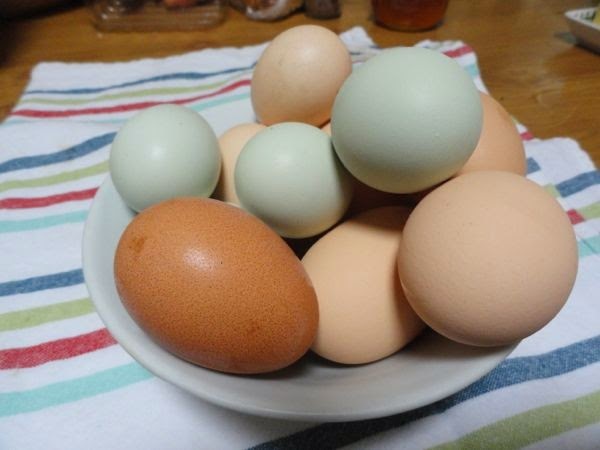 Add eggs from the chickens to that abundance, and we have the warm promise of a self-sustaining home. In the cooler months, the sky is bluer, the grass is greener, the air is cleaner and all things seem possible to me. One of the noticeable differences that cooler weather brings is the way we cook. I think being a good home cook is an important simple life skill. If you move away from expensive cuts of meat and seafood you need to be able to turn plain and simple ingredients into memorable meals using your expertise and experience. In our home we don't have many winter salads, we focus our sights firmly on hearty soups, stews and if we have meat and vegetables, we usually have a rich hot gravy with it. When I cook food here, I hope that it will be within budget, wholesome and delicious but one thing it is always - it's always cooked entirely from scratch and often from local, if not backyard, produce. 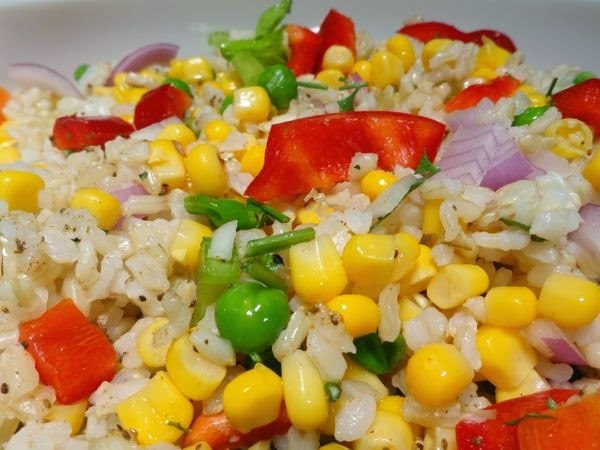 Brown rice and vegetable salad. 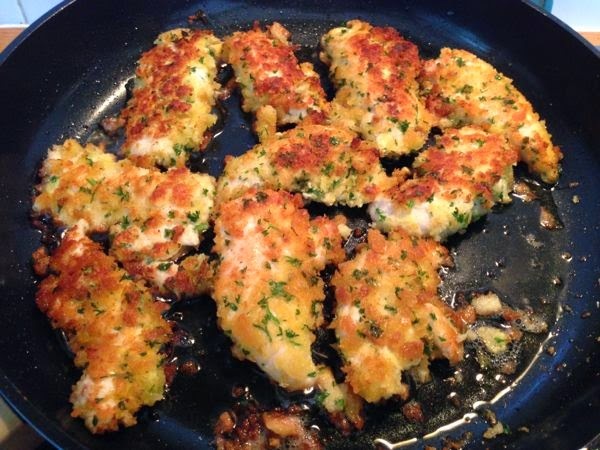 Chicken tenderloins with homemade herby crumbs. I have a lot of cookery books but I use them to give me ideas rather than instructions. 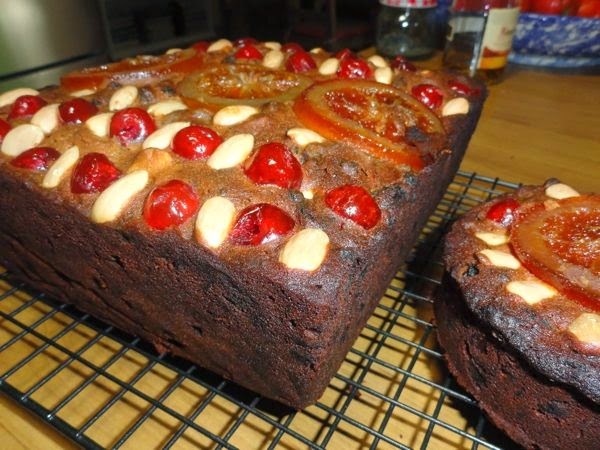 I very rarely use recipes but I like looking at what and how other people cook. If I like what I see, I try to do my version of it. I think the internet is a great way to help develop cooking skills. If you find someone who cooks your kind of food, and they do it from scratch with no cans of soup or packets of seasoning, keep going back to see what they cook and try cooking something similar. These culinary guides are valuable when you first start cooking, or cooking in a different way, and can lead you to success with your meals. 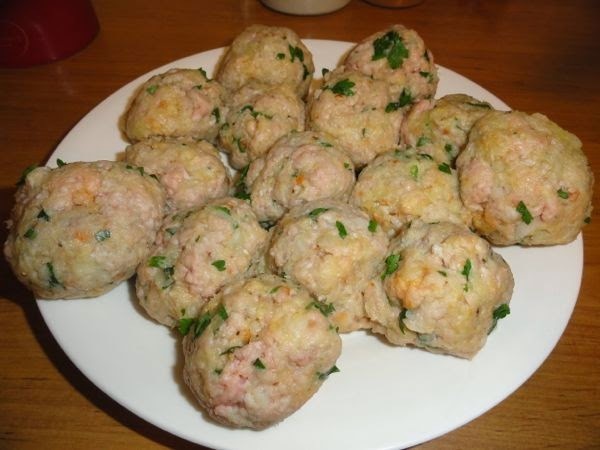 Pork meat balls made using homemade bread crumbs, parsley, onion, egg, salt and pepper. You need to think about your ingredients too and even a dish you've cooked often can be changed over the years. Lately I've found the pork chops we buy have been dry so instead of having a pork chop each, I recently made pork meatballs and vegetables. It was delicious and thrifty and I'll use the same recipe to make a pork meatball pasta sauce as well. It was a timely reminder for me to not get stuck in my ways - to experiment, change ingredients and cooking methods and learn from the results of that. I guess most of us are influenced in our cooking by our parents and what we ate when we were growing up. I still use some of my parents' and grandmother's recipes, but Shane, Kerry and Sunny are all chefs, so I ask them for recipes and advice too. Add to that all my cookery books, the thousands of cooking blogs and I know I'll never run out of inspiration or guidance. And that's good, because cooking good food is important. What style of cook are you? How did you develop your cooking skills? ADDITION: There is a great follow-up conversation about this happening over at the forum. Click here to go there. Well, I'm still pickling cucumbers. 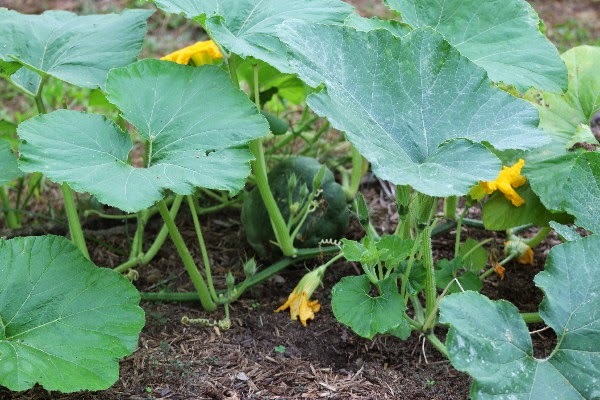 Cucumbers are one of those crops that you have to be prepared for because you get so many of them. We already have pickled cucumbers in the fridge but I'll be making a few more jars from Saturday's harvest. Hanno pulled the vines out on Saturday afternoon and hiding under the terracotta pots he found 30 or 40 harlequin beetles and ladybugs. I'd been wondering what had been nibbling at the cucumbers and there it was - harlequins! It's a good reminder to look under the pots every so often. I've found spiders under them before but never a village of bugs. 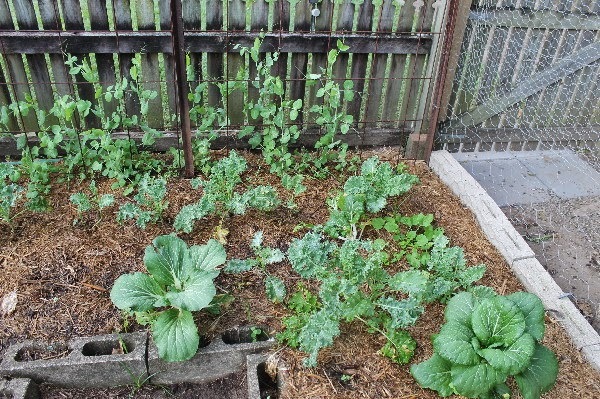 The rest of the garden is growing well. 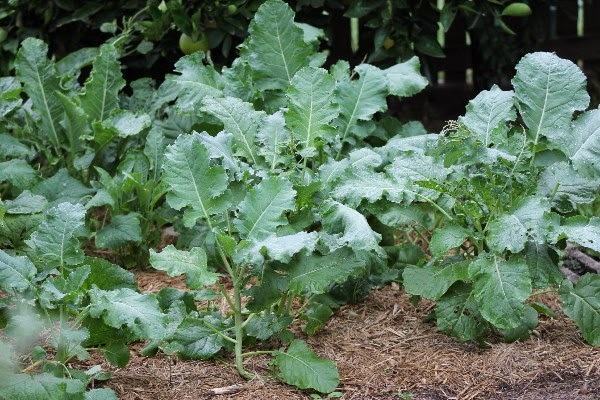 We're harvesting French and cherry tomatoes, herbs, bok choy, ruby chard, lettuce, oranges and passionfruits and yesterday Hanno planted some black kale for the chooks (it grows really tall and doesn't take up much room), cauliflowers, kohl rabi, beetroot and more lettuces. 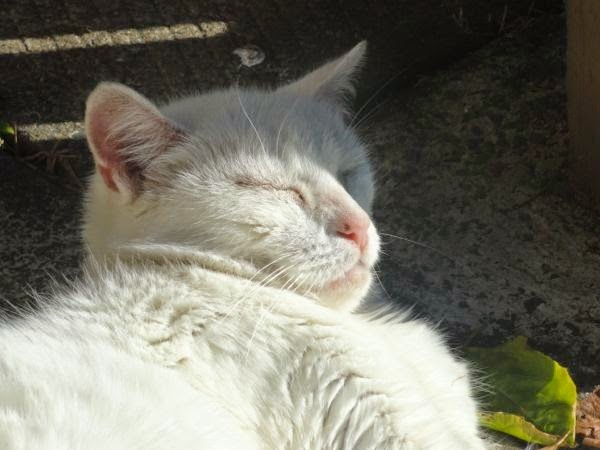 It's such a pleasure to be outside in the sunshine at the moment. I think I enjoy autumn more with every year that passes. With the gentle breeze and the birds swooping in to visit, sitting on the garden bench under the elder tree is such a seasonal pleasure. Sometimes I feel like staying there all morning. The fresh vegetables there to be harvested are the icing on the cake. This patch has now been planted with tomatoes and beetroot. We've had problems with tomato grubs this year. Have you had it too? How are you dealing with it? We're using Dipel (Bacillus thuringiensis) which is a non-toxic, organic spray but I'd love to hear of other methods. 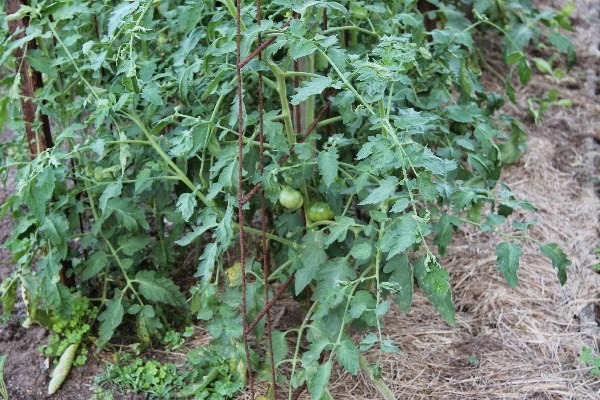 Generally we pick off caterpillars but this type burrows into green tomatoes before you know they're there and only see them when a black hole appears. 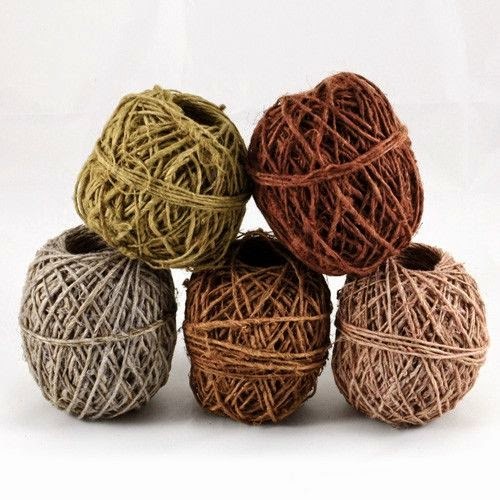 I've picked three with that hole and have them sitting in a basket with the chitting potatoes on the back verandah. I'll ripen them and give them to the chooks. Ah, the chooks. They're laying like mad and I've sold two dozen eggs this week. We've decided not to keep Patrick. We are both big sooky-la-las when it comes to chickens and animals and we don't want to deal with roosters if we hatch any chickens. Patrick is a beautiful gentle boy - a pure barred Plymouth Rock. He hasn't started crowing yet. I'd like him to go to a farm or a good suburban home already set up with a flock of hens. I don't want him to be eaten. If you live on or near the Sunshine Coast and can fill those requirements, we'll happily hand him over to you and hope he fathers some magnificent chicks for you. 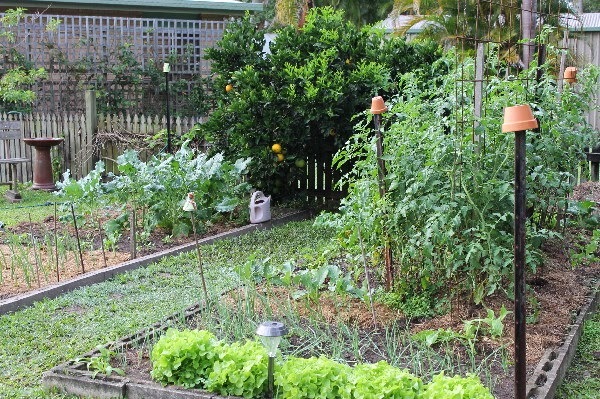 How is your garden going at the moment? If you have a spare few minutes later today can you help Ripe Near Me get some vital points. I've written about it before here but they need our help now to gain international recognition and, no doubt, expand their service through that. There is info here about it and you can vote for them here. I hope it's a wonderful week ahead for all of us. Don't forget Mother's Day is coming up on May 11. 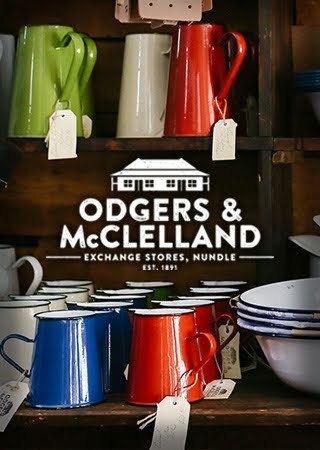 When I look at the stock at Odgers and McClelland Exchange Store I think I could have a use for all of it. Maybe your mum would too. You still have time to order from their online shop. 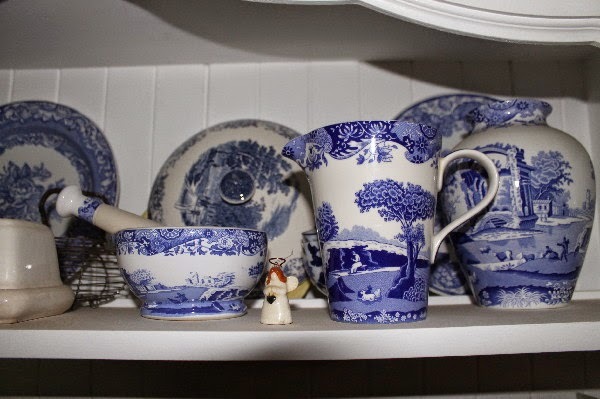 If you're not sure, have a look at the Falconware teapots. I have one, I love it and I use it every day. Click here to see the latest in store. Two important questions are posed on the forum at the moment, along with many, many other items of interest. Drop in for a read over the weekend. Would you like to take on the 12:12:12 challenge? This is a decluttering challenge. You need to find 12 items to throw away, 12 items to donate, and 12 items to be returned to their proper home. This challenge started a couple of days ago but it's fine to start right now. There is a quick one week sale starting today! 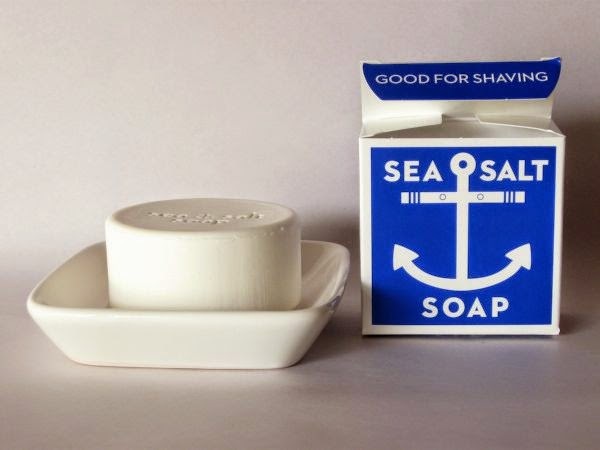 Use code MAYflower for 10% off all items, with FREE SHIPPING for orders over $80 for the week of the sale. Normal shipping rates are $10 per order or free shipping for all orders over $150.00. Please note: Vivian is away from the 16 May to the 13 June. All orders placed during this time will be dispatched when she returns. It's another long weekend here in Australia. Today is Anzac Day, and most Australians and New Zealanders will be enjoying a public holiday. I hope everyone enjoys the day. If you're not in our part of the world, I hope your Friday and weekend is just what you're hoping for. 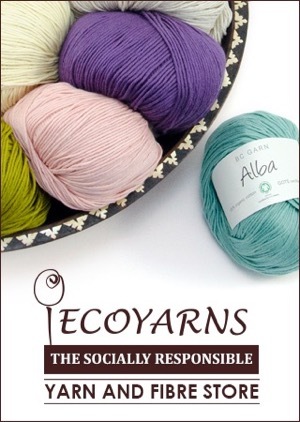 I will be madly knitting away using the beautiful organic cotton from EcoYarns. I'm knitting dishcloths to have a few samples when I do my library talks again this year, and I'm on the first of two shawls. At some point during the weekend, I'll be doing some ironing. 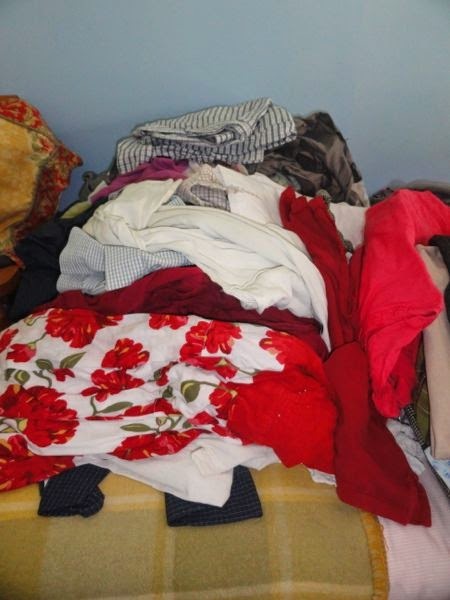 Can you tell by looking at this pile of clothes that I like red? I haven't been on the blog much this week because I've had work to do at the forum, I'm still writing and I had book publicity commitments. I'll be back as usual next week with, I hope, some interesting blog posts for you. The weather is close to perfect at the moment. The evenings are cool, the days sunny, the humidity is low and it makes me feel happy and optimistic. I spent some time yesterday morning planting granny's bonnets (aquilegia) in the vegetable garden. I love seeing flowers in with the tomatoes and cabbages, it's something you don't expect. Flowers bring the bees in too, and that makes it even better. Hanno has been working in the garden too. He's trying to remove the stumps of trees felled a few years ago that are now providing a problem with his ride on mower. Soon we'll organise a day together, when it's a bit colder, when we weed and prune the front garden and plant out a few cuttings I've been growing in the bush house. Whether in the front or back garden, this time of year is our busy time in the garden and when we're not out there, we're thinking about being out there. But there is one thing we must remember at this time of year, when the weather makes being outside such a sublime pleasure, and that is to go out there, enjoy it and just soak it all in. No work, just sitting or walking or sipping tea. We make these spaces to be beautiful and serene and it at times like these that they should be appreciated, looked at, thought about, enjoyed and celebrated. 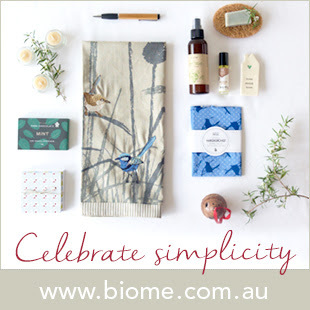 Simple life is as much about slowing down and enjoying your surroundings and your home as it is about the thrifty management of household funds and low impact living. We live in an age where many people are permanently busy and although I am busy at times, I take time out of every day to relax, think and appreciate what surrounds me. Those times, sometimes brief and some not so, help me get through the harder times. Would it surprise you to know that when I'm not giving talks around the libraries I only go away from my home about two or three times a month? Here is where I want to be, I've moved away from wanting to driving around or shop or even to be where a lot of other people are. Here at home is my place and I'm happy here. Always. I'm not saying that you should be that radical in your relationship with your home life and the work you do there but I do encourage you to drop the "busy" mantel, to start saying "no" and make a slower life. 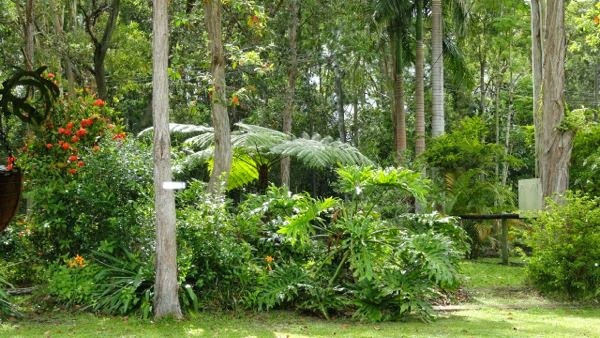 Recently I read this newspaper article about busy lives and the scenario of busyness was so far away from my personal experiences when I was in the garden yesterday, that I had to link to it in the hope it would resonate with you as well. I loved: "Learn to say no": it's such a cliche, and easy to assume it means only saying no to tedious, unfulfilling stuff. But "the biggest, trickiest lesson," as the author Elizabeth Gilbert once put it, "is learning how to say no to things you do want to do" – stuff that matters." We all need to say yes to ourselves. So am I saying to stop doing all your work and just enjoy? No, that would become boring very quickly and we all need to work. But I am saying that in the middle of your work take a break, to plan downtime into your schedule, and to slow down and appreciate what you're working for. I hope you're enjoying life as you live it and not saving up that enjoyment for later - the weekend, retirement, or whatever. Enjoying the ordinary things in life and having simple down time to relax is what helps us carry on and live life to its potential. But no one will come along and tell you to stop working, no one will tell you to not be busy all the time, you have to give that gift to yourself. Everyone should taste produce they've grown themselves at some point in their life. It's a skill we should all have - that ability to plant a seed, seedling, vine or tree, manage it, watch it and eat it when the time it right. However, some people can't do it. They have either no time or they have no land. If you're in that group of people because you're either out at work during daylight hours and have no energy when you're home, you're raising a young family or looking after an elderly relative, or you simply just don't have the land because you're renting, I might have a solution. My solution won't give you an abundance of food, nor will it allow you to give up shopping for fresh food at the market. 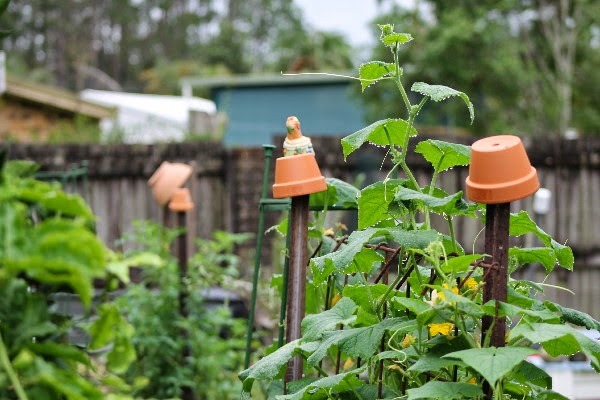 What it will do though, is allow you to grow one thing well so you can experience the taste of real food and start to develop food growing skills. This project can be carried out indoors or out in the backyard. 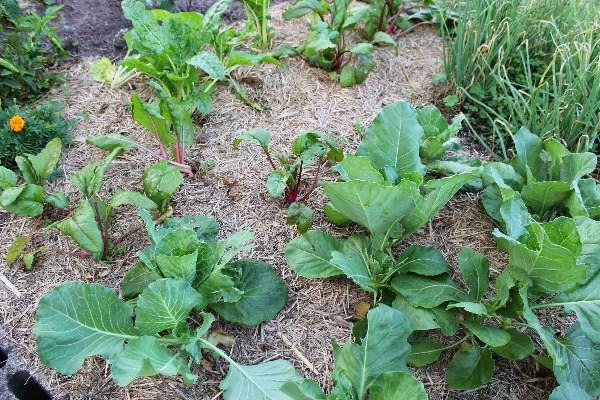 The options are, outside, to plant a fruit tree or vine or, inside, to grow mini salad lettuce. 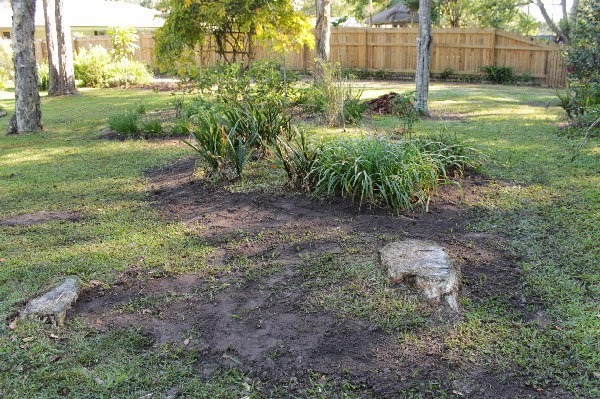 If you're renting and you're going to plant the fruit tree, you may need to ask your landlord for permission to do this. Once you've got that, you're set. Most landlords, even those opposed to a garden going in, would probably be okay with a tree of suitable size. But there will be some readers who own their own land but haven't yet fully utilised its opportunities. Please include yourself in this. Hanno and I travelled to Germany in the late 1970s so I could meet his family. We intended to stay for a couple of months but ended up staying a couple of years. 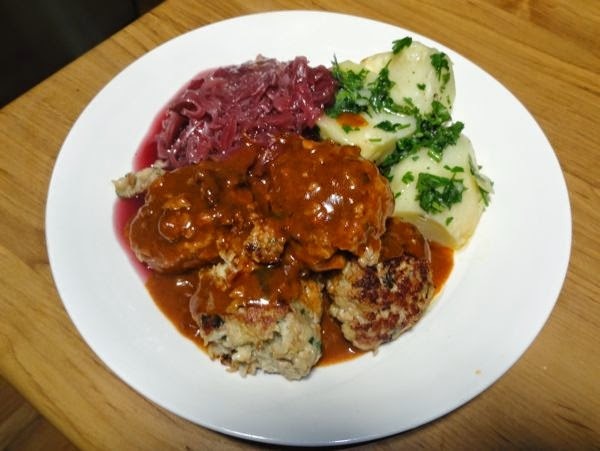 I often went food shopping by myself, and although I went to German language classes, I picked up a better understanding of the language when I was out shopping. One day I bought some peaches from Greece. Unlike Australia at that time they imported food from other countries and it was really interesting to me to taste these fruits. 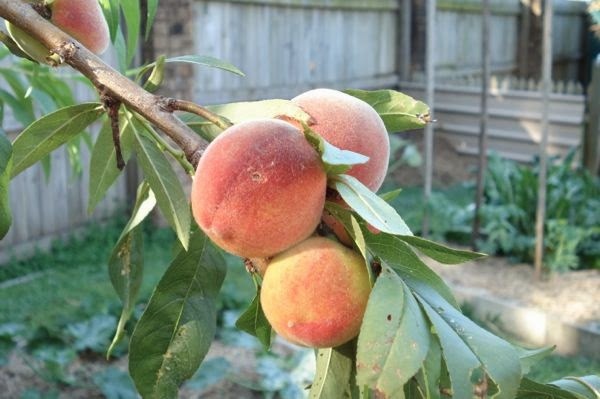 Those peaches from Greece were the best I'd ever tasted and I was convinced that it was the climate there, coupled with the soil the peach tree grew in that made this magnificent and remarkable difference in taste. And then I grew peaches here in our backyard and I knew then that the mysterious element was time. Many fruits and vegetables grown now don't taste of much at all. Tomatoes don't taste like tomatoes, apples are bland and don't taste like they used to. I think that's because they're grown fast, usually fed with all sorts of man-made fertilisers and then they're stored. They grow true to the look they should have, true to the smell, they feel the same, but they do not taste the same. They've lost the taste of real food. When we grew our peaches, they started off small but even then they had the most delicious, intense peach aroma and flavour. Our tree grew in the middle of the vegetable garden and it was watered when the vegetables were and fertilised with comfrey. Those harvests, wow, they were magnificent. It was like we were eating the sweetest, most carefully tendered peaches, sold at the best shop in town. But the truth was we had tendered them in our little backyard, along with all the other food we ate. We gave it no special treatment, no extra water; it was just allowed to grow at its own pace and to develop the unique and extraordinary flavour of traditionally-grown, organic peaches. Sadly we pulled out that tree when the fruit fly found us a few years later. But now we have our oranges that the fruit fly don't bother with. Hanno was in the kitchen yesterday while I was writing and in he came with a slice of orange - "taste this," he said. Well, it was like the peaches all over again - that intense orange flavour that commercial oranges don't have. That orange was perfect, although it didn't look like much. 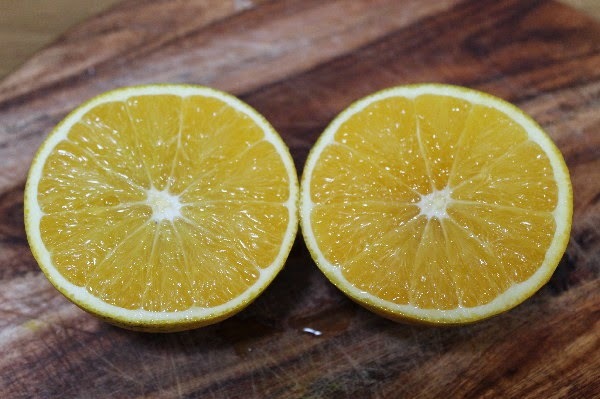 It was still tinged with green on the top of the orange, it had a couple of bumps, but that flavour, the flavour of a sun-soaked, organic orange was there to make us forget all about the look and just remember that taste. So if you have room and the right climate I encourage you to plant an orange. 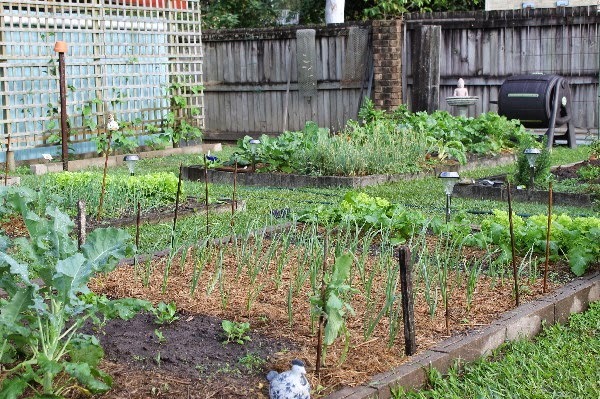 You'll be growing some of your own food but the work required will be a small fraction of what you'd be doing if you had a vegetable garden. A tree is a real investment - unlike most vegetables that have to be resown every year, a tree will take a few years to start, then you'll have oranges galore. You'll still have to learn about what the orange tree needs to thrive, you'll have to water it - that's nothing. 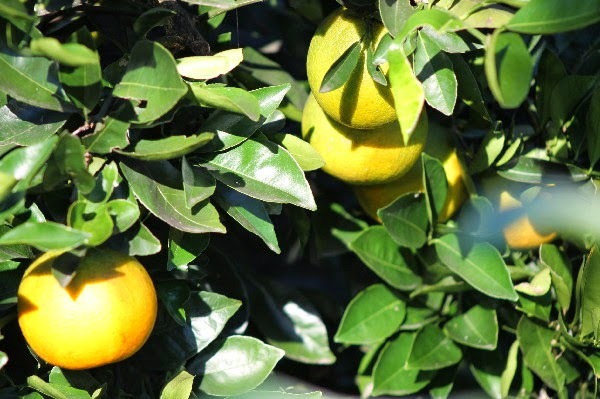 And then once a year, you'll get a crop of the sweetest oranges from your backyard. You will have produced fruit; real food. 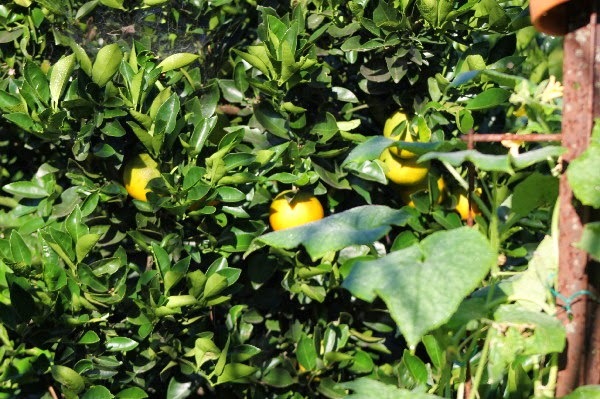 An orange tree needs an open sunny spot to grow, dig a large hole to plant it in, add compost and manure - both can be bought in bags at the produce or hardware store or at the garden centre. If there are any flowers on the tree when you plant it, snip them off. I know it seems counter-productive to do so but it will allow the tree to establish its roots in the first year instead of concentrating on producing fruit. Do it the second year too. After that it just needs fertilising with the manure a few times a year and a deep watering once a week, maybe a bucket full. 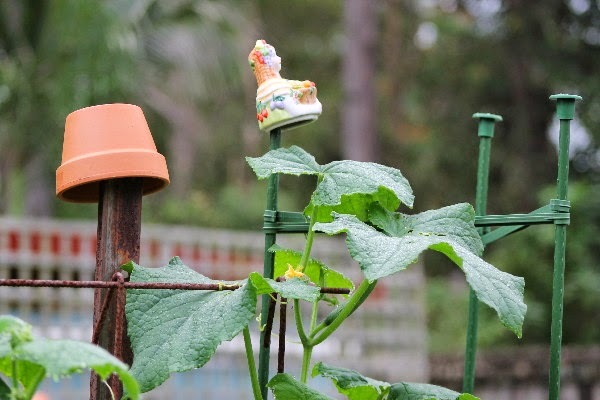 When the flowers and fruit appear, increase the watering to two buckets a week. Luckily it's not just an orange you'll be getting. With your oranges, as well as eating them fresh from the tree, you'll have juice, fruit for jam, flavouring for cakes, biscuits and your savoury dishes and if there is some left over, maybe a bottle or two of cordial. We have a Washington navel orange tree - we have a couple of them and they're a good tree in any backyard. If your climate is too cold for citrus, or you don't like oranges, try a cold climate apricot, pear or apple. Grow what you love and what can be grown where you live but do give it a try. 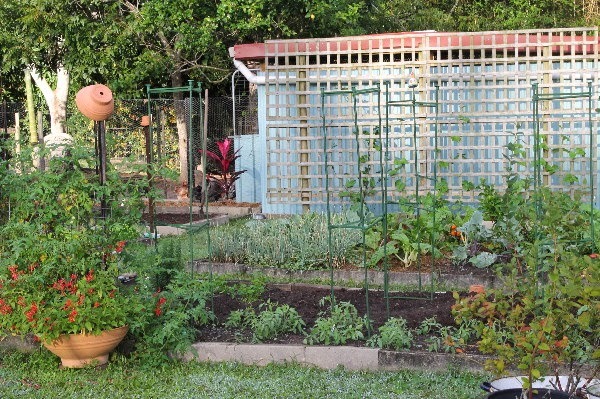 You'll be gardening and producing some of your own food but without the fussing of a vegetable garden. 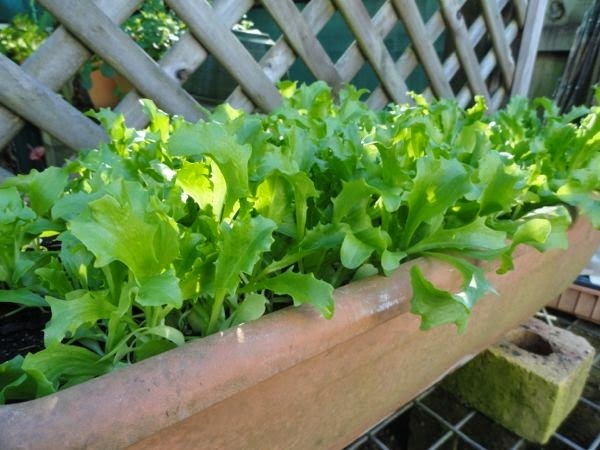 Just pull out these tender little lettuces when you have a salad and sow new seeds to replace them. And if you have no room, time or permission, try the indoor option. Get a long trough pot, similar to those used as window boxes, fill it with potting mix and compost and plant lettuce seeds of your choice. 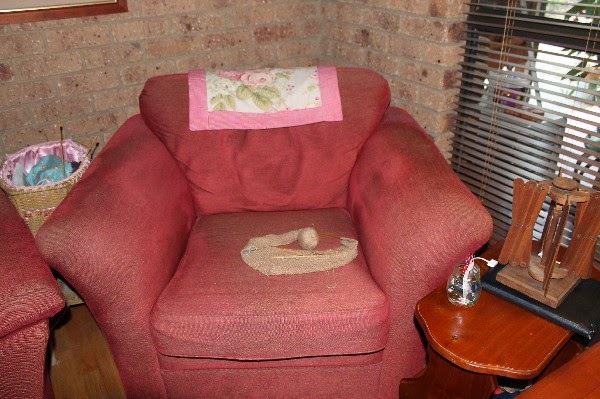 Sit the pot on a warm window sill, or outdoors if the temperature is right. Lettuce need bright light to grow but they don't need full sun, so a light window sill would be perfect. 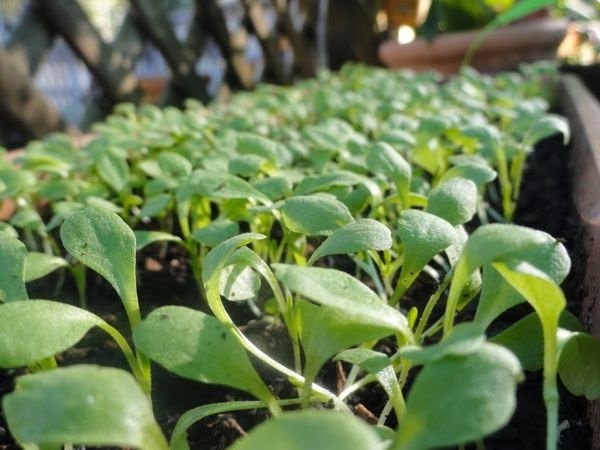 You'll have to water them and care for them, and when they're two or three inches high, pull them out, cut off the roots and replace those you pull out with a new line of seeds to continue the lettuce throughout the season. 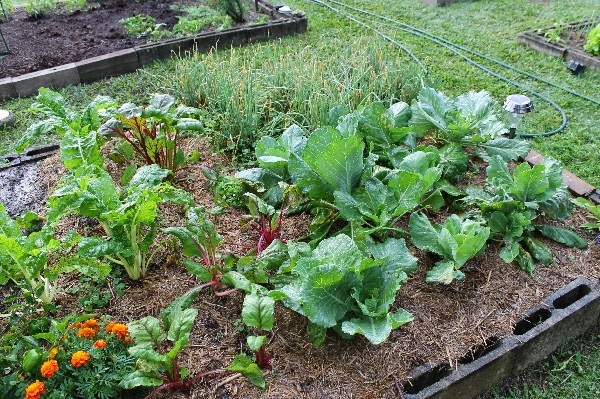 What you've have are little mini lettuces, with all the nutrition of a well grown organic lettuce, and it will be fresh. You can't buy freshness - you have to grow it yourself. 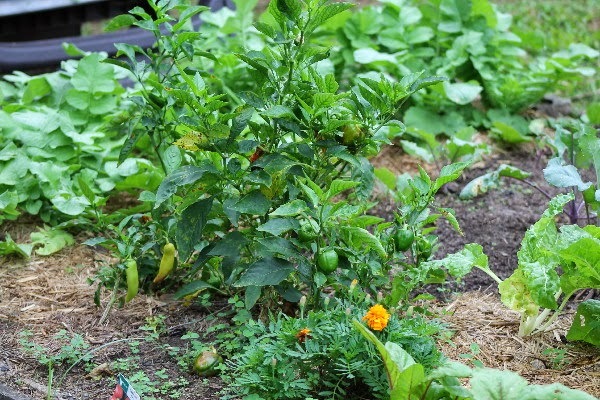 But if you do this small project, not only will you be starting to learn abut food production, you'll be eating some of the best lettuce or oranges you've ever eat. And that is priceless. 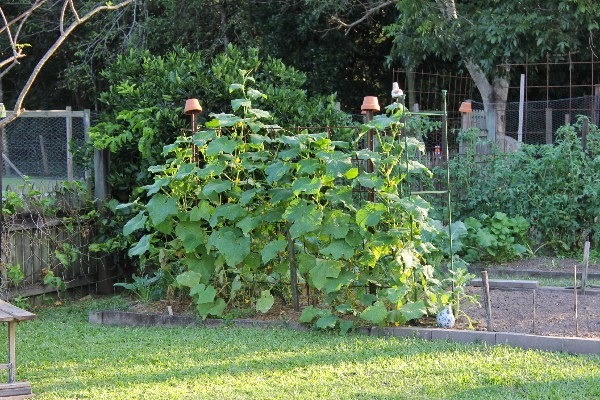 What other ideas do you have to help non-gardeners with food growing skills? 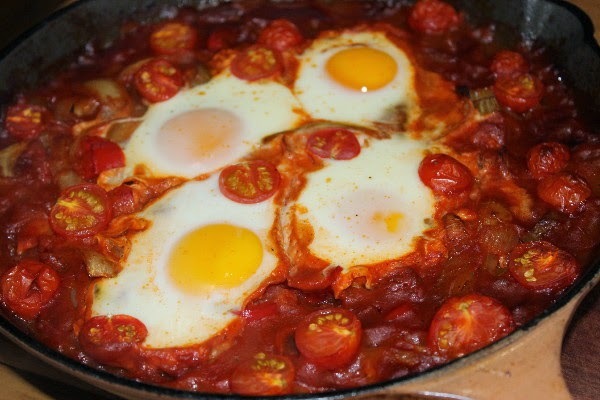 Baked eggs in spicy tomato sauce. I've been reading a few threads at the forum this morning and came across an older thread I hadn't seen before. It's by one of our mods, Tessa, and she's asking about food goals for the year. So whether you want to read a list of month-by-month goals or read about many specific things our members are going to concentrate on, it's all there. I found it very interesting, and quite motivating, to read what other's have in mind. 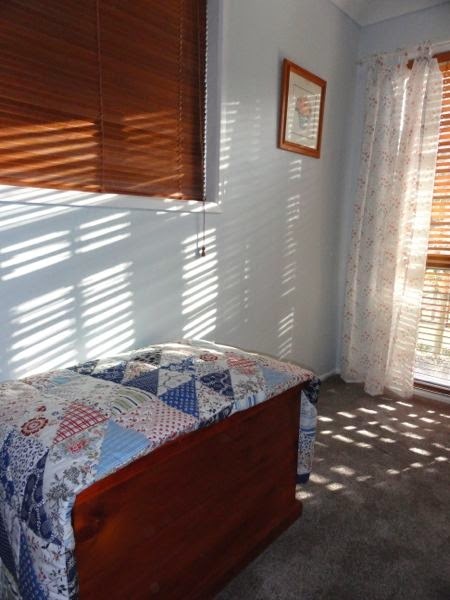 If you're in northern NSW, or in Sydney and would like a weekend away, go no further than Nundle. This little town is hosting an Easter festival and everyone's invited to two days of live music, games, magic shows and great food. Go here for more information. "We have been on a quest for a simpler life since we left Vancouver with one small child. My boss demanded full time work, I had no childcare space (despite a 1.5 year wait list), a long commute, etc. We have greatly improved our lives in coming to Canberra but I want a whole lot more. Life is so serious here in Canberra. It does not make sense to me that our generation has to squeeze ourselves into cities or suburbs with super high mortgages, commuting, childcare, rushing around, etc. just so our children can go to good schools and continue this pattern themselves. I would love to read about your ideas for people with young families looking to escape that treadmill." It never occurred to me when I was younger that the majority of us sell our life hours for money. It was only when I was older, and much more concerned trying to balance work with life that this strange reality dawned on me. The way we live in Western society is so deeply entrenched most of us never question it. But it is what it is, the majority of us have not been born into great wealth. We have to earn our keep by selling what we've got - our intellectual and physical capabilities and the life hours that go with them. I am a worker bee, have been all my life, so you won't be surprised to know that I think work is a good thing. I firmly believe that we all should work for what we get in life. But I don't think we should work an entire lifetime. We aren't here just to keep our country's businesses going, we are here to find love, happiness and contentment and to build strong families. Doing that will keep our species and our nations going. So if you were to ask me how to set up a strong simple life that would function well right through until old age, I would say to work hard to buy a home and when the mortgage is paid off, to move to a blend of paid work and home work in a town you want to live. Though I imagine there would be some who would want to give up work altogether when they're established and debt-free, and there will also be many folk who live in the same place all their lives. 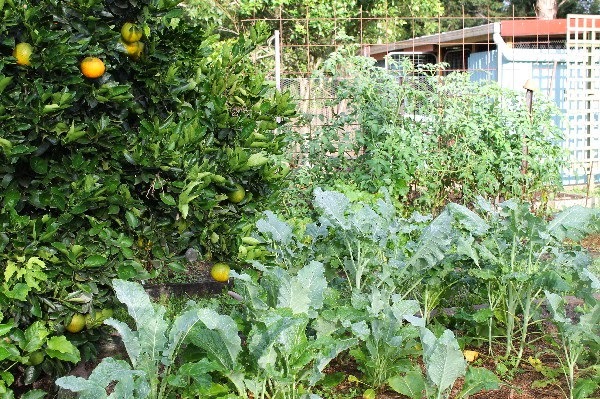 When you are debt-free and working towards it, your focus would be to reduce the cost of living as much as you can, to make your home a place of production where you make as much as possible, and to keep the traditional skills of homemaking and small farming alive while you live your simple life in, but separate from, the mainstream. Remember, that you don't have to wait until you pay off your debts to start living a much simpler life. You can start right now if you want to. You need to think about what you want in your life, what your own values are and decide to step back from buying everything you want. Then, by living frugally and paying off debt as you go, you have time to develop the skills you will require when you dive fully into this life. Some of you will pay off your mortgages faster than others but that really is the key to this. To be free of debt and to live frugally, producing some of what you need, while working enough to pay for your lower cost of living. We all know that life doesn't always go by any rules. If you've never been able to buy a home and are a lifelong renter, you're still well and truly included in this, although your path might be a bit more unstable if you are in a situation when you have to leave a loved home because the landlord has other plans. Buying a home puts more power into your hands but not all of us can do it, or we do it, then lose it. But if you can live frugally then it might be possible for you to go to part-time work too but you'd have to have a good emergency fund to cushion you from the unexpected. We all need that. 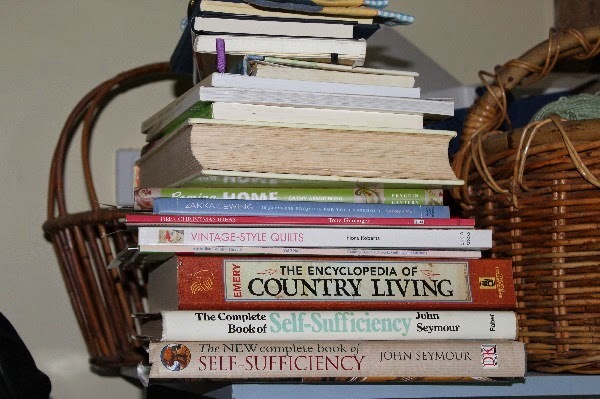 From the time you decide to live a more simple life you need to be more prudent and thrifty, you'll learn what you need to know in your particular situation, you'll plan and budget. You have to look after what you own and make the most of what you have. 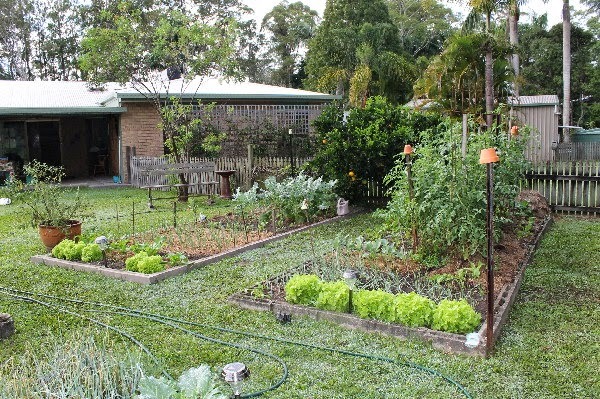 If you have land, use it to grow food. 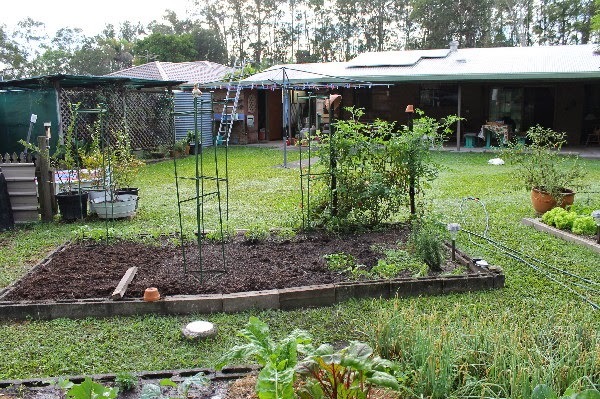 You'll be getting the full value of your land if you can live on it and grow food on it as well. Don't be tempted by fashion or updating what you own to keep up with the neighbours. Make your own cleaners, dispose of all the disposables, make do, cook from scratch, stockpile, and pay every cent you save on your mortgage. And while all this is going on, find the best in every day and be content with what you've got. Simple life has many offerings but you have to look for them, nothing is handed to you on a silver platter. Yes, your life will be full of activity but there is nothing wrong with that. The work you do for pay and at home will give you the life you want, and it will build character. Most of the work you do at home is worked at your own pace, it's gentle work and it gives you what you need. And as the months turn into years, I hope you'll find the contentment and happiness that can be found living this way. So to answer part of Sarah's question specifically: I think it does make sense to work to set yourself up in life, buying a home and what you think you need to live well. After setting up with a partner you should be focused on earning enough to buy a home. I think it's best to do that fast with both of you working, and certainly before children are born. But that only has to be done in cities and suburbs if that is the only place you can find work. You may be one of those lucky people who can work from home and not be tied to a specific location. When the kids are born, if you can continuing paying off your debt as fast as possible, while enjoying life as well, you'll have a good chance of being able to transition to part-time work in about eight to ten years, depending on your mortgage. Those early years of hard work and sacrifice pay off when you own your home. Then, if you want it, you could sell your town or suburban house and buy somewhere less expensive, maybe in a semi-rural location where the houses are cheaper, but your still have access to city life when you want it. By selling a city house you'll have enough to buy a rural home and a nest egg to keep you going while you establish yourself. 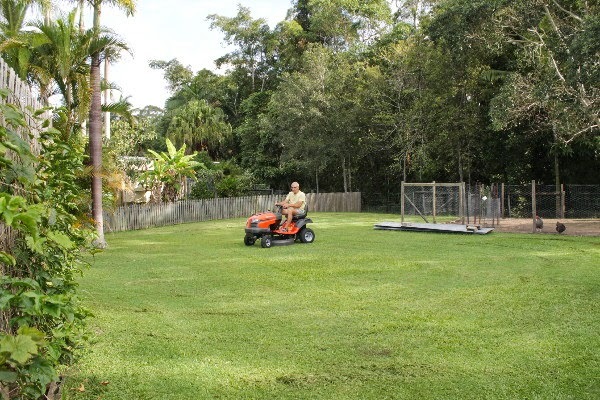 Many people know from an early age they want more than what city life offers, others get sick of the rat race in mid-life, sell up and go and live in the country. I'm reminded of Duncan and Megan at the Odgers and McClelland Exchange Stores who gave up city life with two young boys and set up in the country town of Nundle. Now they operate a homewares store and if you read Megan's blog, you'll see they're living a busy but very rich life. Sarah, you must live true to your values and if they don't include paying off a high mortgage, private schools or commuting then you have to work out a plan to move away from that scenario. You don't have to live in any particular place, but you need to have the means to live the way you want to live. Start planning your escape. Work out a plan to pay down your mortgage, put the children in good public schools when you need to and work towards a life that will enrich you. I think it all starts with buying a home. When you have that asset, you'll be able to structure the life you want but don't forget to live simply from today. 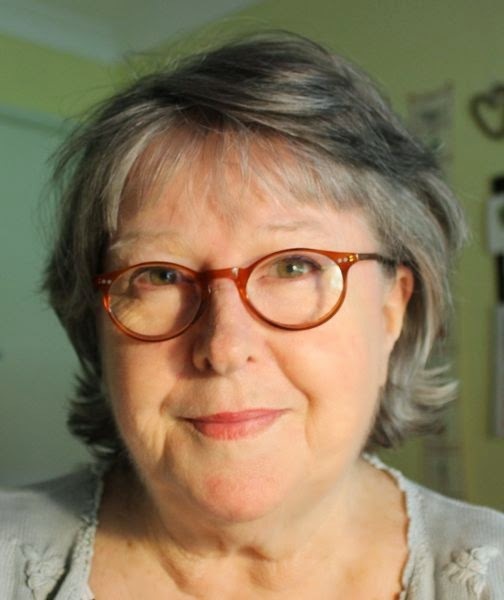 If you'd asked me when I was fifty, when I would start to feel old, I would have told you 80ish. I turn 66 today and I'm starting to feel old. 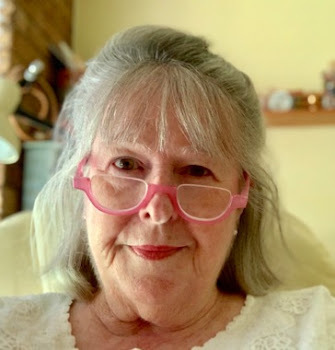 Feeling old to me means I'm starting to slow down, I'm less inclined to take on new things and while I feel I've seen it all, I also have an optimistic view of what is coming and my ability to meet whatever it is with confidence. BTW, I don't think growing old is a bad thing, it's what we're all doing every day. I think life often gets better as you age. When I was 50, I wanted to live till I was 110. I'm not that selfish now and whenever my time is up, I'll be grateful that I had an interesting life and for the great majority of it, I was happy. Living to a really old age is not part of my plan now. I don't want to die tomorrow or in the next few years, but I don't want to live passed 90 either. I am happy knowing that my family is settled and that grandchildren have been born. I have had a few successes in my life, but having the family I have has been the greatest of them. Today Hanno and I might go out for a seafood lunch. It depends on Kerry though because he flies back in from his job today and Hanno has to pick him up. If we're too late for lunch, we might have afternoon tea up the mountain at the French cafe. 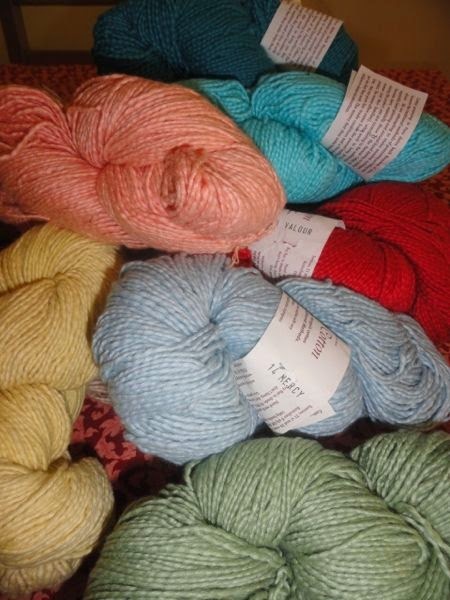 It will be good to have a day off too, I'll do some knitting, wander around and no doubt I'll talk on the phone to various family members and friends. It's a day for pottering, not working. I want to thank you all for being here today and for reading what I write. It's not often a woman my age gets to have an audience and that's something that I think about almost every day. So thanks for giving that to me, for reading, for commenting and for walking this path alongside me. Over at the forum today there's a very interesting thread about how various folk started their simple lifestyle. It's well worth a look. It's that time of year again when many of us are starting our gardens so we can eat the freshest and tastiest of vegetables, fruits and herbs. 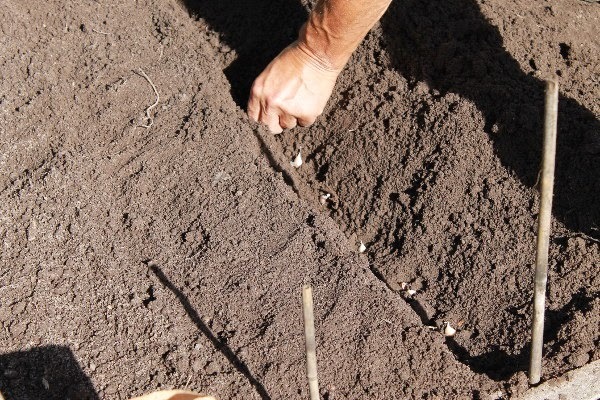 Hanno started preparing the soil here on March 3, and over the following weeks, home-sown and bought seedlings started going in slowly. 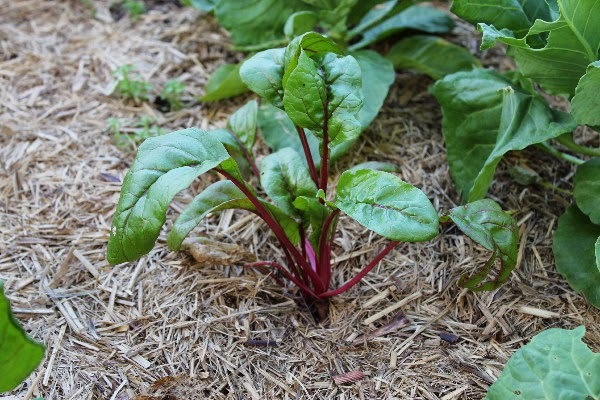 Last week some of last year's garlic was planted along with kohl rabi, turnips, lettuce, kale, Amish paste tomatoes and more ruby chard. 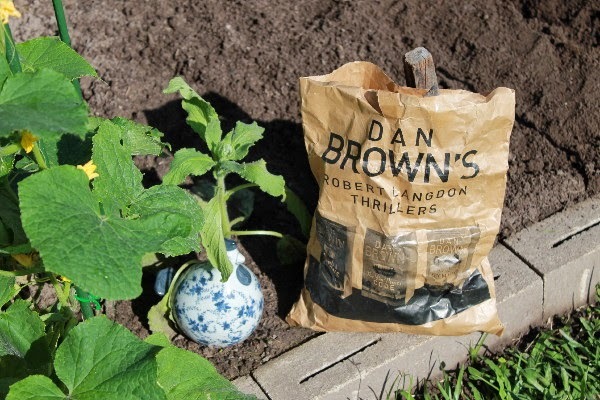 Already planted and growing well are green beans, tomatoes, passionfruit, bok choi, peas, silver beet, onions, broccoli, cucumbers, cauliflowers, cabbage, capsicums/peppers, Welsh onions, sage, borage, parsley, pumpkin, daikons, thyme and yesterday I repotted an avocado and a bay tree. I wonder what you're planting. For those of you who emailed asking whether Hanno will continue to do our lawn or will we get someone in to do it, here is your answer. A close up photo would reveal a smiling face. When we discussed it, Hanno said he wanted to continue to look after his own place, and that sealed it for me. It was raining here yesterday, the remnants of a cyclone up north. That steady, gentle rain makes the plants grow like nothing else can. It feels good knowing the soil is wet and the tanks are full. Most of the hard settling up work is done now, we only have a bed of potatoes to plant and then the follow up plantings whenever there is a vacant spot. Of course there is still the occasional weeding and watering but that's not a chore, I think it's relaxing. A few tomatoes are growing and we've just added some Amish paste tomatoes for sauce. These are the French tomato Rouge de Marmande. I call this petticoat lettuce, I'm not sure of it's real name. 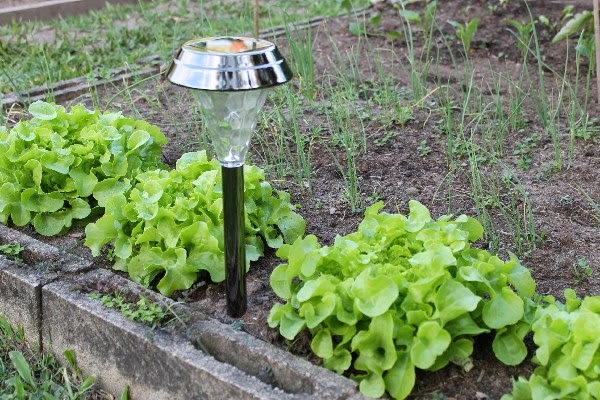 We added a couple of these solar light to the garden when we noticed bandicoot holes in the lawn and a few eaten plants. They did the trick. No more holes. 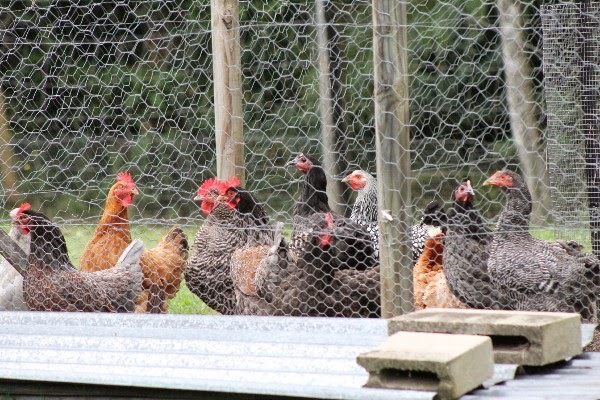 The chooks were all corralled into the corner of their run when I went out yesterday to take these photos. There is Patrick on the far right, he should be showing the frightened girls what to do but he's still too young and silly. 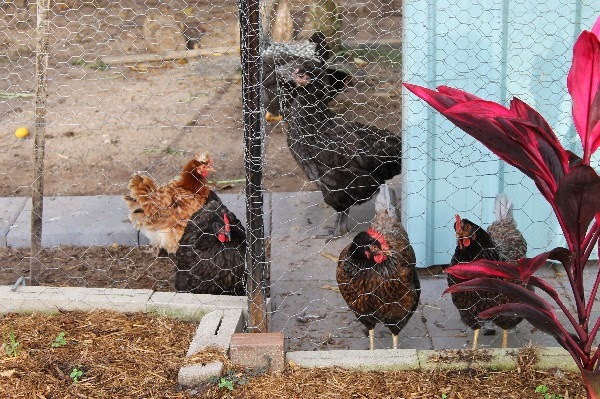 And this is why the chooks were scared. 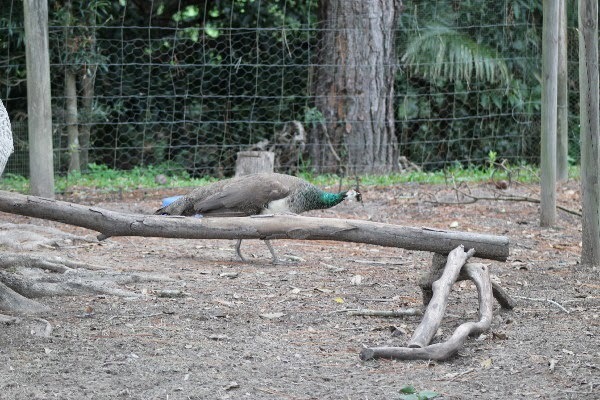 A young peacock from over the back fence. I soon got rid of him. The last pumpkin left on the vine. 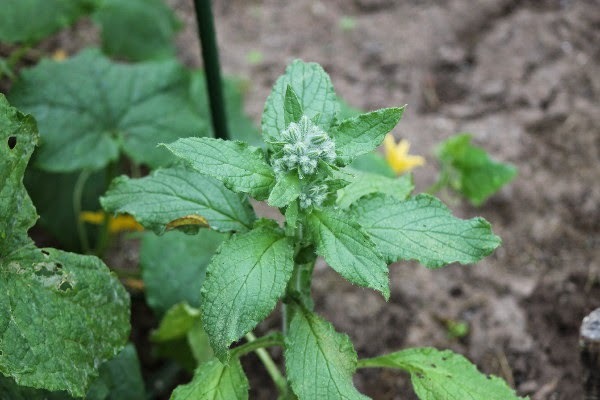 Borage ready to burst into flower. 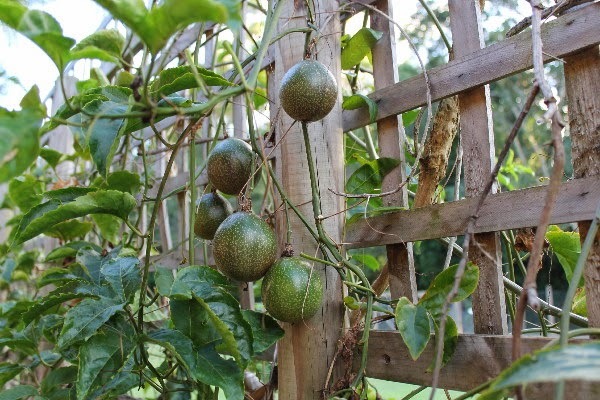 There is an abundance of passionfruit. A bag of last year's garlic, just out of the fridge. 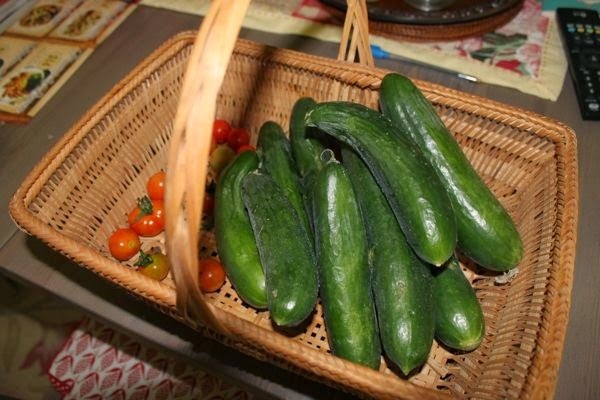 When you grow your own vegetables you tend to collect recipes for things you didn't make before, such as pickles. We had so many cucumbers last week, far too many to eat fresh, I decided to pickle some in spicy vinegar. Those I made up yesterday could sit in the fridge for months, although they will probably be eaten much sooner than that. 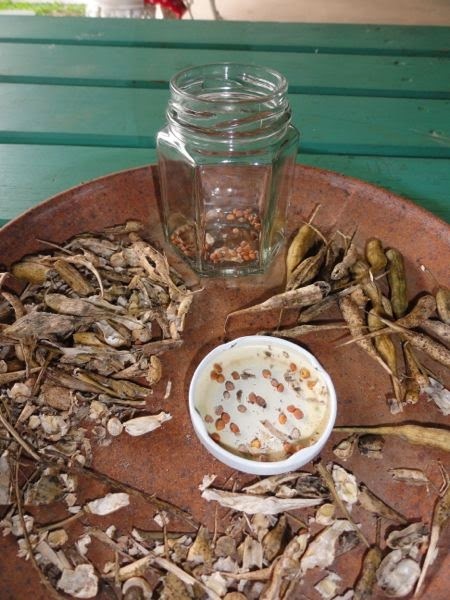 You don't need any special equipment and recycled jars will do to store them. 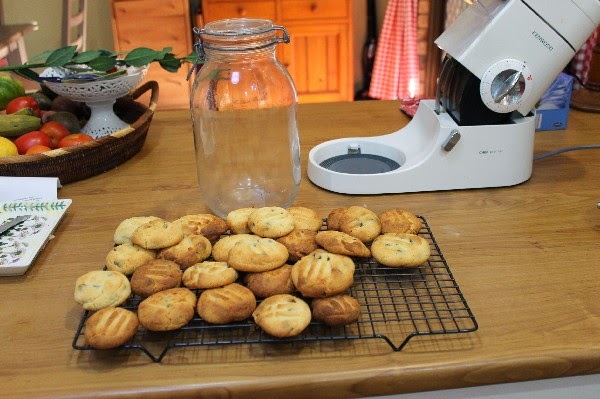 Take your clean jars and either boil them or put the jars in a slow oven (150C/300F) for 15 minutes to sterilise them. Keep them all warm until you're ready to pack the cucumbers in the jars. The jars should be warm for that. I think I used about 12 cucumbers but you can pickle any amount, just adjust the quantity of spiced vinegar you make. 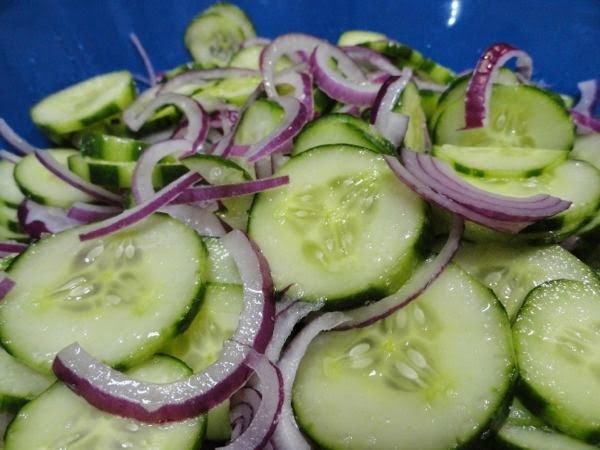 The night before, peel and slice all your cucumbers and place in a large bowl. Pour over about a tablespoon of salt. Don't worry, you won't eat the salt. 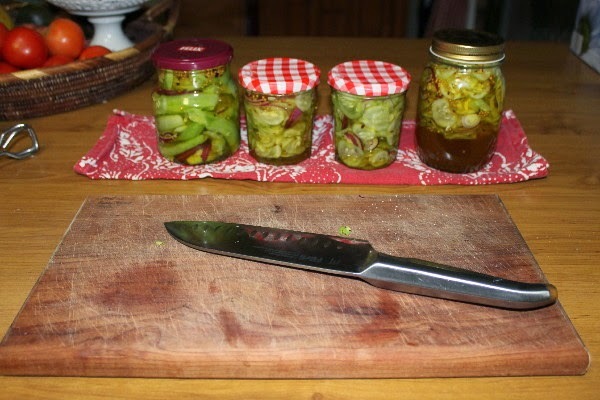 If you don't drawn the fluid from the cucumbers it dilutes the vinegar too much in the jars. Mix the cucumbers around with your hands, making sure the salt is well distributed, put a clean tea towel over the top of the bowl and leave it overnight. The following morning there will be a lot of fluid in the cucumber bowl. Pour it all into a colander and let the salty water go down the drain. Run clean cold water from the tap over the cucumbers to make sure all the salt is removed. Leave the cucumber in the colander for about an hour to drain. You can make your own variation of this spiced vinegar. Depending on whther you like it very vinegary, or sweet, or spicy, add more or less vinegar (make up the volume with water), sugar, spice. Make it to suit your taste. You don't have to include any spices if you don't like them. 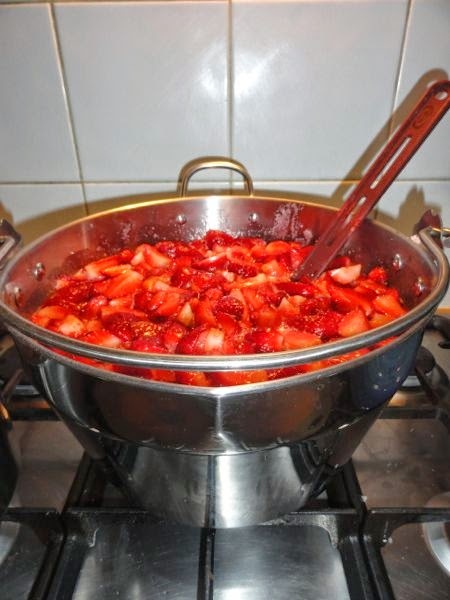 Place the above in a saucepan and bring to the boil, stirring to make sure the sugar dissolves. 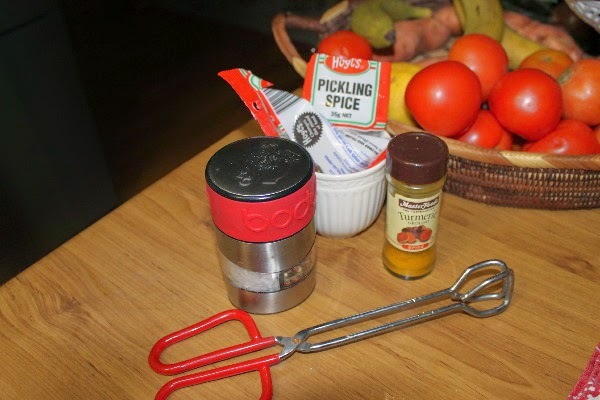 To make up the pickles, pack the cucumbers into the sterilised jars and add enough vinegar to cover them. 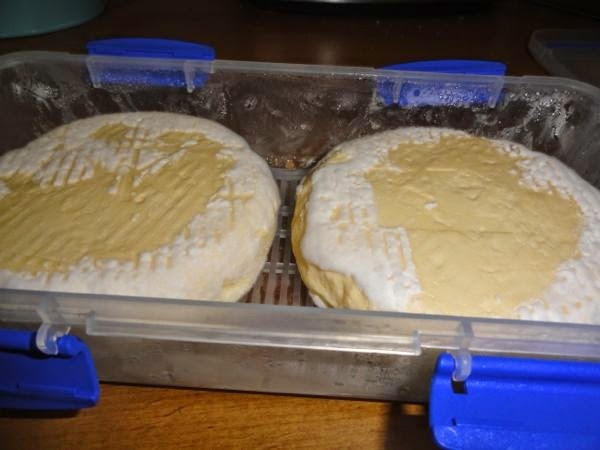 Put on the lid and allow to cool overnight before storing in the fridge. I hope all my friends up north came through the cyclone with no flooding or other problems. It looks like we'll all be able to dry out a bit today. Take care, everyone. Can you buy my book now?